Each year, thousands of people across the country join the Walk MS volunteer team. Ending Multiple Sclerosis for good will take all of us. 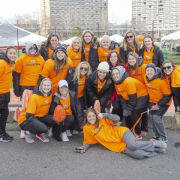 To make events possible we need an army of volunteers and volunteers are exactly what it takes to make Walk MS happen! Please consider spending the day at Uniontown FD Social Hall, on Sunday, May 5th as a volunteer. We are in need of greeters, lunch servers, finish line cheerleaders, assistance with set up and clean up, and help with check-in. There are different roles and shifts available...and there is no job too small to make an impact! Times vary based on volunteer opportunities. Please see sign up for details.